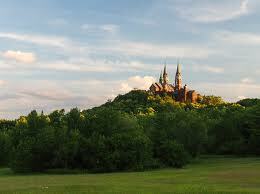 About 30 miles north of Milwaukee, Wisconsin, the spires of a basilica known as “Holy Hill” pierce the sky. The spires direct thoughts upward in praise of the Creator who made not only the beautiful countryside and high peak on which the basilica catches the morning light, but also the architects who designed and the builders who erected such an impressive edifice. David didn’t use the term “holy hill” to limit God’s presence to one building or one mountain. He understood that God, who made all things, cannot be contained. Stephen quoted from Isaiah 66:1-2 to show that, although it is appropriate to construct buildings for worship, God made the entire universe and doesn’t dwell in any habitation made by human hands. David’s questions in Psalm 15 are more about person than place. Who may have fellowship with God? Who may dwell in intimate communion with the Most High? The remaining four verses of this short psalm consist of two sentences, the first a profile and the second a promise. The lengthy profile sentence details the character of the kind of person who may sojourn in the Lord’s tent and dwell on his holy hill. and does not take a bribe against the innocent (Psalm 15:2-5a, ESV). This listing pulses with active verbs: walks, speaks, takes, honors, and swears. It seems to be a litany of does and don’ts. Certainly it indicates that actions are important. But the first part of this listing guides the way we view the rest of it: He who walks blamelessly and does what is right and speaks truth in his heart. Who walks blamelessly and does what is right? We know from Psalm 14:3 and Psalm 53:3 (indeed, all of Scripture) that no one is without sin. Jesus Christ was the only sinless person. He alone walked and talked blamelessly. He always did what was right and spoke truth in his heart. Only through union with Christ can anyone begin to meet Psalm 15’s criteria for communion with God. Speaking truth in the heart is the primary requirement. There are many people in pews every Sunday who think they’re sitting in a private compartment on the train to heaven. They never look beneath their shallow veneer of religiosity to examine their heart. These are the kind of people who will cry, “Lord, Lord,” but God will say, “I never knew you. Away from me, you evildoers!” (Matt. 7:21-23, NIV1984). They’ve done a lot of what appeared to be good works, but they were not motivated by love for God and their neighbor. They didn’t speak the truth in their hearts. Truth-speakers will not slander with their tongues, do evil to a neighbor or bring a reproach against a friend. They will have the courage to name a vile person as despicable, but honor those who fear the Lord. They will make promises that advance others, even to their own detriment, and will not waffle. They won’t lend money at exorbitant rates or take bribes against the innocent. He who does these things shall never be moved (Psalm 15:5b, ESV). Mountains may fall into the sea and philosophical foundations may crumble, but truth-speakers shall never be moved. Wildfires may wipe out homes, floods may surge through churches, but believers stand firm in the face of natural catastrophes. Governments may remove freedoms, people may persecute Christians, but hearts speaking the truth will not tremble. Those who love others out of genuine love for God stand on solid ground. Their faith is embedded in the solid rock of Jesus Christ. Treating other people well doesn’t secure intimacy with God, but showing love to others grows from a genuine relationship with God through Jesus Christ. The body’s fruit demonstrates the heart’s root. The deeply-rooted speaker of truth travels with God in his tent. The truth-speaker dwells securely with God on his holy hill. What are you saying in the secret places of your heart? What differences are there between the way you treat people when you know you have an audience and when you think no one is watching? What do you think it means to dwell with God on his holy hill? What does it mean for you that you will never be moved?